If you’re looking for a vanity number generator, you’ve come to the right place. We’ve been helping business owners find great toll free numbers since the 1990s. In fact, over the years we’ve even been the backend vanity number search engine for a few large phone companies. Today, anyone can use our vanity phone number generator (offered free on our signup page) to instantly search for numbers and generate a list of vanity numbers available for instant purchase. Our quick-search tool looks up available numbers in real time using multiple databases (including the FCC’s national spare pool). If the 800 numbers you want aren’t available, our tool will generate available vanity numbers that are a close match to the one you’re trying to look up. 1. Searching for a vanity number is worth it because it can boost sales and marketing. Is it even worth spending time and money searching for the “perfect” vanity phone number? The answer is yes, because finding a good number doesn’t have to be time consuming or expensive. And more importantly, and the benefits of a good number well out way the costs. Vanity numbers are more than just easy-to-remember numbers. They can be a powerful marketing tool. In addition to being memorable, they coat a key customer touchpoint (your business phone number) in your branding. When small businesses build a brand they grow. Good vanity phone numbers can spell a word or phrase that matches your product or service, your website address, your company’s name, the value you offer, or the industry you serve. Vanity toll free numbers have been known to improve your brand recognition and reinforce brand loyalty. And in doing so, boosts your conversion rates, word-of-mouth, and customer referrals. Sound crazy? Some vanity 800 numbers are so good (e.g., 1-800-FLOWERS or 1-800 DENTIST) people have literally built multi-million dollar businesses around them. But you don’t have to have the perfect custom 800 number to reap the marketing benefits. If you’re a roofer, 1-833-ROOFER would be a killer number to own, paint on your truck, and advertise on the radio. 2. Before you do a toll free vanity number search, brainstorm and make a list. Great, you want a vanity number for your business. Now, what to do? The first thing you need to do is make a list of all the keywords and phrases that relate to your business. Try and keep the word or phrase around seven characters because a phone number is seven digits. If you come up with a word or phrase that is less than seven letters, that isn’t a problem because you can simply use a placeholder digit or digits as necessary. For example, if your company does roof work you could use the number 855-55ROOFS. Even better than placeholder digits are call-to-action words like GET, BUY, GO, NOW etc. Using the roof company example, instead of 855-55ROOFS a better number would be 855-FIXROOF. If you come up with a word or phrase that is more than seven letters that, isn’t a problem because you can simply use dial-over characters (aka “dial-overs” or over-dials). For example, the insurance company Progressive uses this toll free number: 1-800-PROGRESSIVE. Now you may notice that the letters “SIVE” are tacked on at the end after the first seven characters (1-800-PROGRESSIVE). Those characters (SIVE) are called dial-overs. If your company’s name is too long or the word or phrase you want to use is more than seven characters, you can use dial-overs. If you saw it on a billboard would you remember it? If you hear it on the radio could you spell it? 3. Make a list of words related to your brand and name. There are three key groups from which you should make a list of names. The first group of words and phrases should be related to your company’s actual brand name. For the cable company Comcast Xfinity they use the vanity 800 number: 1-800-XFINITY. They got lucky because XFINITY is exactly seven characters a perfect fit. But not every company has a seven letter name. This is where you can incorporate the tips we discussed earlier using placeholder digits, call-to-action words, or dial-overs. For example, Federal Express or FedEx uses the number 1-800-GOFEDEX because Federal Express is too long and FedEx is too short. Using the word GO in front of FEDEX makes for a great vanity number. 4. Make a list of words related to your industry. 5. Make a list of words related to your value proposition. Your value proposition is a statement that summarizes why your potential customers should buy what your business sells. The statement convinces potential customers that your product or service will add more value or solve their problem better than the competition with similar offerings. Let’s go back to the roofing company example. A roofer’s value prop might be “High-quality, low-cost roof work done right.” In this case you might want to search for vanity number relate to the terms “high-quality” and “low-cost roofing”. 6. The perfect vanity 800 numbers and local vanity numbers can be hard to find. Looking at the toll free vanity number examples above you might be wondering where the vanity 800 numbers are? True 1-800 numbers have been around since the 1960s which means that unfortunately, there’s not a lot of them left in the national toll free number spare pool to choose from. There are certainly some left as companies go out of business and drop their old numbers, but by and large, since there are fewer true 800 numbers available, there are less vanity number options for them. You’ll find the most searchable options with newer toll free number prefixes such as 888, 877, 866, 844, and the most recently released 833 numbers. Local vanity numbers are also harder to come by because they are not stored in a single national database like toll free numbers are. Each phone company in North America has an independent batch of local numbers and can only offer local vanity numbers form their private spear pool. Because toll free numbers are stored a single national FCC regulated database, companies like UniTel Voice, can build API integrations to not only search their own database, but also the national toll free number database at the same time. Therefore, there’s always going to be more toll free vanity number options available. 7. The best time to purchase a vanity number is right before a toll free prefix is released. Just like website domain extensions, the best time to grab a vanity toll free number is right before they are released (pre-order/reserve them) or snap them up directly after they are released. Right after the number comes out you have the most vanity number choices. So if you are a roofing company, you might be able to get 833-ROOFING which would be a killer vanity number. 8. Some companies rent vanity numbers and some companies sell them outright. It’s important to note that some phone companies rent vanity numbers while other companies, like UniTel Voice. sell them outright. With UniTel Voice, when you pick a vanity number and sign up for phone service, you own that number. Down the road, if you decide to cancel your service with us, you can port your toll free number to another toll free service provider of your choice. You own the number no strings attached. Other companies have a different business model. They retain ownership of your toll free number and rent or lease the number to you to use in certain geographic reigns. For example, a phone company could lease the toll free number 1-800-ROOFING to a roofer in Chicago and a roofer in New York. If you call the number 1-800-ROOFING from a Chicago area code you will get the Chicago-based roofer. If you call the from a New York area code you’ll get the New York roofer. The upside to leasing a toll free number is you don’t have to search for a good vanity number. The downside is it costs a lot of money to rent the number and at any time the phone company renting the number to you can drop you and rent the same number to your competitor. Therefore all the advertising investment you put into promoting the vanity number will be lost and could even help your competition. 9. UniTel Voice will personality assist you with your vanity number search. You can search for vanity toll free numbers on our website’s signup page and get instant access to the national toll free number database by selecting the “Custom Toll Free” option. 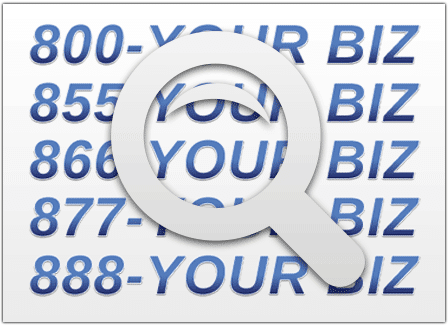 If the phone number you are looking for isn’t available, our site’s vanity number generator will create a list of some closely related number options that are available. But if you still can’t find a good number or just need a little help, our support team would be happy to assist you with your search. We’ll help you brainstorm ideas, we’ll search the spare pool for you, and we’ll email you the search results at no charge and with no obligation to buy. Just give us a call or chat with us online. We’re here to help! 10. UniTel Voice is more than a vanity phone number generator & search engine. Here at UniTel Voice, our value proposition is much like the fictional roofing company we used in the example above: We provide high-quality phone service at a low-cost price. We not only offer a wide selection of toll free vanity numbers, we also offer virtual phone system features that make our service perfect for running your small business from your any phone (home, office, or cell). However you need your vanity lines set up, we can help. And our customer support is 100% USA-based and always free.